The need for a change of scenery or plainly a different mindset, what shall it be to ignite a creative mind and set it into motion? I guess that in a way blending both phrases together into a new setting might even make this shift, a new drift into a brand new horizon, into something miraculous and absorbing. So here we have an interesting collaboration of three folks that should have worked together long ago. At the center there is the Swiss shredding, Neo Classical maniac, Roger Staffelbach, once one of the pillars of the Progressive Metal band ARTENTION and founder of ANGEL OF EDEN. To the right stands one of the utmost talented vocalists in Neo Classical / Power Metal, John West, once the voice of ROYAL HUNT and from time to time clinging to his own solo project. To the left arise the keyboards’ man, Masestro Mistheria, collaborated with Staffelbach, Rob Rock and Bruce Dickinson while also maintaining his own solo career in check. Basically, many, including yours truly, will perceive this as stunning supergroup prospect. Together the distinguished members formed ARTLANTICA, could be a continuance to ARTENTION and ANGEL OF EDEN, but the new machine has a mind of its own. 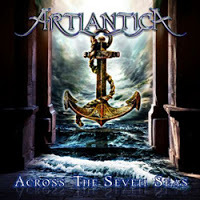 Signed to SPV / Steamhammer Records, ARTLANTICA conceived the debut “Across The Seven Seas”, a masterful merger of Neo Classical, Power and Progressive Metal with a few reminders of 80s Hard Rock. Certainly this isn’t the first time that a supergroup of this caliber arises to astound its listeners with newly found magical implementations. On the other hand, I found ARTLANTICA to be true to the “Art” within their name, a high form of musical conception that hopefully will continue on and on. Along with their honorary guests manning the rhythm section, Steve Digiorgio (Bass), John Macaluso (Drums) and Dani Löble (Drums), a vision was fulfilled with flying colors. I felt like listening to a darker version of Yngwie Malmsteen’s RISING FORCE, yet with vibes of ARTENTION, ROYAL HUNT, BALANCE OF POWER, LABYRINTH and early KAMELOT. Staffelbach articulate guitar riffing that range from playing the basic stuff that made some impressive rhythm fretwork notations, including energetic melodic fast forward crunchers to slow tempo grooves with smarmy leaks, alongside gruesome shredding that would leave Malmsteen with his mouth wide open as several of his solos are beyond what is normally displayed by bands of this kind. Staffelbach’s songwriting in general, highly contributed to this albums chief aspects as being a powerhouse of melodic Metal frenzy. Of course that without his peers’ mastery, following the works of the session musicians, this would have never happened. I’d be honest with you boys and girls, when it comes to Neo Classical / Power Metal made by European hands; I mostly enjoy the speeding as within the core of the songs it elevates the music’s expressions towards various distances and perspectives, like a journey to the stars. The swiftness of the rhythm guitars, the romantic keyboards and the enchanting vocals under the pounding of the fast paced drums, is a work of art that no many can muster just right. “Nightmare Life”, though not composed as a blazing speedster, is ARTLANTICA’s both progressed manipulation aside to a clear Power Metal inspiration. I was sucked by the chorus and its music, West won’t leave me be with his Tony Martin type vocals, got to admire his vocal abilities. The intermission of the piano a few minutes only began to heat things up into darkened scenery where the chorus ruled the night once again. The enthusiastic bouncy “Devout” and “Fight For The Light” are the designs of how to create complex music yet with such a flow that won’t give away the intricacy under the veil. Such mesmerizing paces and enchanting atmospheres are things to cherish. “Return Of The Pharaoh Pt. 3”, didn’t know where to look for the first two parts as I just felt the urge to do so. This instrumental made me think of one of Malmsteen’s work, more guitar talk than vocals (not that there are any around this one). Although I couldn’t exactly connect the dots between the title and the music itself, as it sounded rather spacey than of ancient Egypt, I was infatuated by the track’s proceedings, everything clicked just right, incredible punctuation and attention to details. Therefore, to sum this up for you, ARTLANTICA is a world within a world with plenty of surprises and pleasing of melodic benefits. These three guys are masters in their craft and they should be acknowledged with a listen.